Seasonal congestion is the bane of my existence, driving me to distraction at times. I don’t like taking certain products, because some of the ingredients in said products tend to make my scalp itchy. Nobody likes an itchy scalp. The hubby is one who rarely takes anything for any ailments, he’d prefer to just tough it out. Unfortunately, his seasonal congestion computes to excessive snoring at night. This is the time of year where the weather isn’t too cold, yet not too hot and we can throw open the windows to let the fresh air in after being cooped up all winter. Unfortunately, it’s this time of year that the seasonal congestion really raises its ugly head. 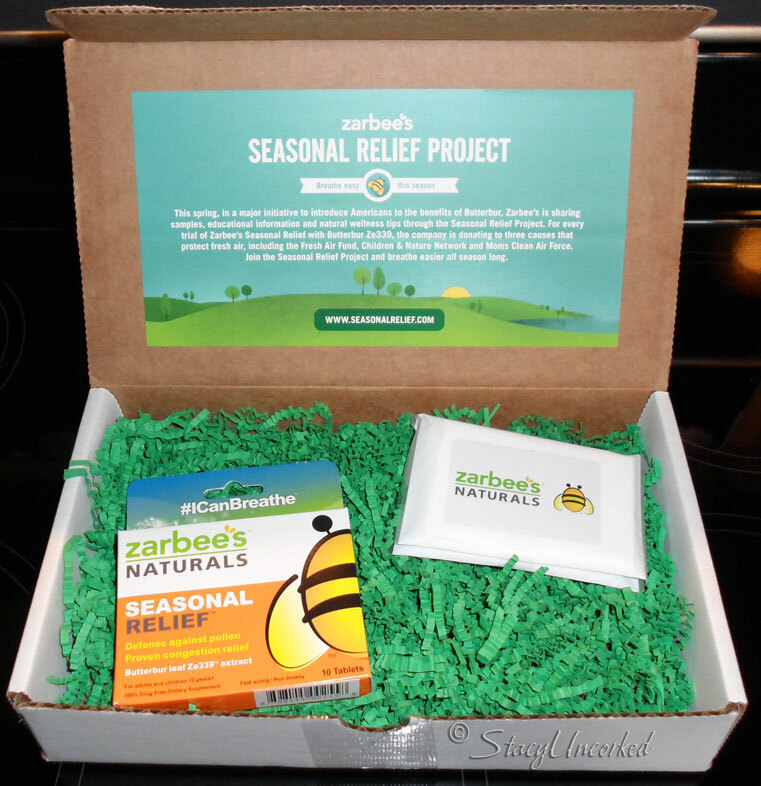 Zarbee’s Naturals’ Seasonal Relief to the rescue! Zarbee’s Naturals Seasonal Relief is a dietary supplement that is a natural way for anyone ages 12 and up to treat seasonal congestion. It is made with Butterbur, a plant extract that has provided health benefits to European people for hundreds of years. Zarbee’s Seasonal Relief works quickly without side effects including drowsiness and grogginess. I don’t know about you, but I really dislike the side effect of being groggy or sleepy, along with the itchy scalp I mentioned earlier. I’m already suffering enough with the congestion, why exacerbate it with more annoyances? Since Butterbur extract is relatively new to the United States, Zarbee’s is hoping to get the word out to Americans about all the natural benefits Butterbur can provide when it comes to seasonal congestion relief. Current clinical support shows effectiveness for adults and children age 12 and older, and safe for routine use without concerns about resistance building*. Zarbee’s Naturals products are doctor-formulated, and their family health and wellness line is free from drugs, alcohol, gluten and dyes. Knowing that it’s made from natural ingredients will let me rest easy at night. In more ways than one. 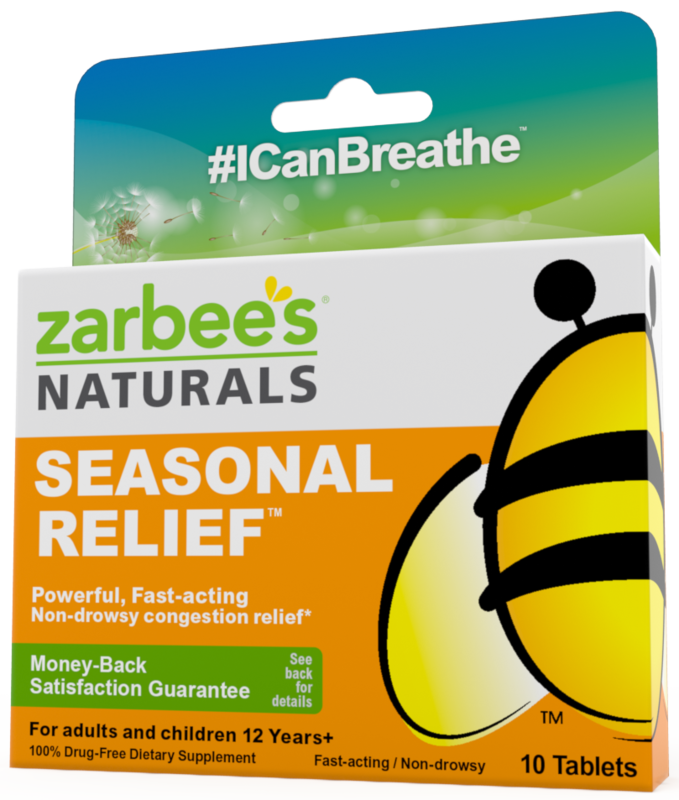 To help people breathe easier, this year Zarbee’s Naturals launched the Seasonal Relief Project, sharing samples, educational information and natural wellness tips for those suffering from seasonal congestion. Every time someone visits the site to share how Zarbee’s Naturals’ Seasonal Relief helped them, Zarbee’s will donate to 1 of 4 causes promoting exposure to and protection of fresh air. Zarbee’s Seasonal Relief is available nationwide at CVS.com and Target stores. 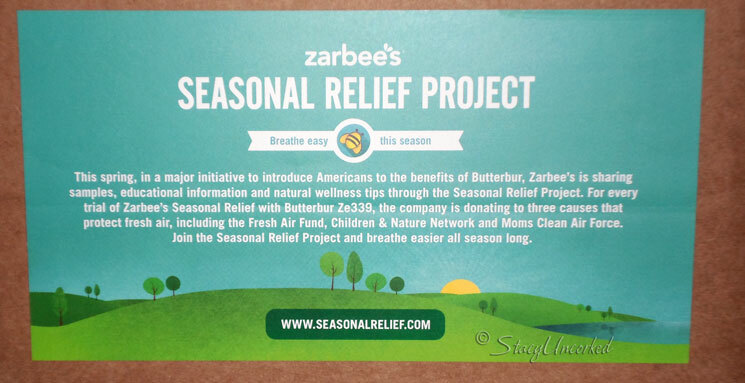 Be sure to visit Zarbee’s Seasonal Relief Project for your free sample! Do you happen to suffer from seasonal congestion like I do? Have you tried any natural relief things that work? Note: I participated in a campaign on behalf of Mom Central Consulting for Zarbee’s Naturals. I received a promotional item and a product sample as a thank you for participating.g. As usual, all opinions are my own and not influenced by outside sources. See my disclosure policy here. This entry was posted in Alert, Announcement, Review and tagged #ICanBreath, Alert, Announcement, dietary supplement, Education, free sample, Review, Seasonal Congestion, Zarbee's Naturals, Zarbee's Naturals' Seasonal Relief Project by StacyUncorked. Bookmark the permalink.